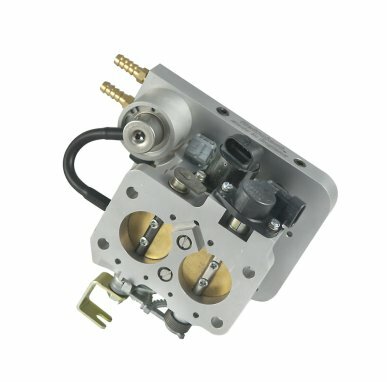 Converting your carburettored classic to electronic fuel injection has never been easier thanks to the new Weber Retroject Throttle Body from Webcon. 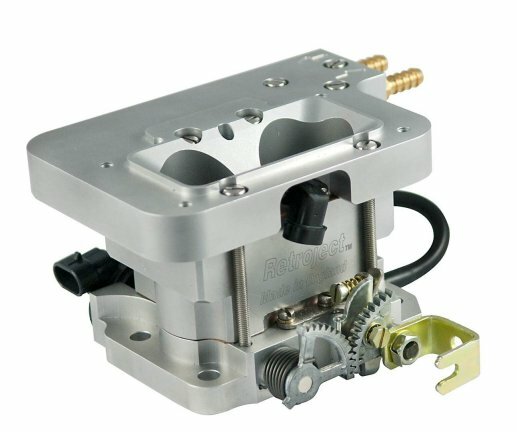 Essentially, Retroject is a dual injector throttle body designed to directly replace the Weber 32/36 DGV and 38DGAS. The critical dimensions are identical (height 86mm) including positioning of throttle lever and throttle rotation, so it will be possible to remove a Weber twin choke carb., bolt on Retroject, add any aftermarket ECU and loom and a high pressure fuel supply from a Webcon WFP600. In doing so you will then have the power, driveability, torque and economy of a modern EFI system on your classic car. It really is as simple as that. No messing about with new throttle linkages, new air filters or new inlet manifolds. Retroject is supplied complete with 2 x Genuine Weber 480cc/m PICO fuel injectors, TPS, air temp sensor, idle motor and 3 bar fuel pressure regulator,. Thus a complete, bolt on, EFI solution comes at a fraction of the cost and complexity of multi throttle bodies. The air intake for the IACV is blanked off during assembly by means of the top cover gasket. If the IACV is not being used, then this needs to remain sealed, however if the IACV is being used, the idle air feed will need to opened by inserting the shaft of a 3mm drill into the top feed hole until the gasket is punched through. Retroject is ideal when using a modern engine in a kit car and EFI is needed to comply with modern catalyst requirements. It will also be ideal for off road, marine and general classic car use.